Late summer, 1938. Hollywood film star Fredric Stahl is on his way to Paris to make a movie. The Nazis know he’s coming—a secret bureau within the Reich has been waging political warfare against France, and for their purposes, Fredric Stahl is a perfect agent of influence. What they don’t know is that Stahl, horrified by the Nazi war on Jews and intellectuals, has become part of an informal spy service run out of the American embassy. Mission to Paris is filled with heart-stopping tension, beautifully drawn scenes of romance, and extraordinarily alive characters: foreign assassins; a glamorous Russian actress-turned-spy; and the women in Stahl’s life. At the center of the novel is the city of Paris—its bistros, hotels grand and anonymous, and the Parisians, living every night as though it were their last. Alan Furst brings to life both a dark time in history and the passion of the human hearts that fought to survive it. 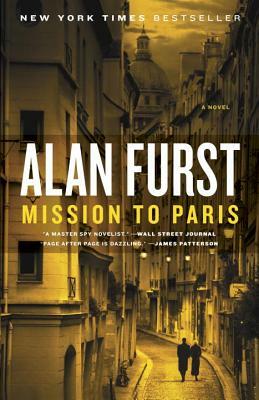 Alan Furst is widely recognized as the master of the historical spy novel. Now translated into eighteen languages, he is the author of Night Soldiers, Dark Star, The Polish Officer, The World at Night, Red Gold, Kingdom of Shadows, Blood of Victory, Dark Voyage, The Foreign Correspondent, The Spies of Warsaw, and Spies of the Balkans. Born in New York, he lived for many years in Paris, and now lives on Long Island. "I am a huge fan of Alan Furst. Furst is the best in the business--the most talented espionage novelist of our generation."